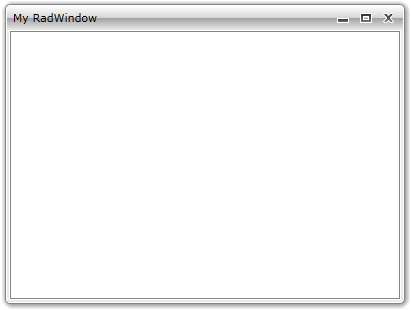 The RadWindow allows you to display a header in the top part of it. To specify the header you can use either the Header or the HeaderTemplate properties. If you have a window-specific header, use the Header property. As the Header property is of type object you can set it to any control that you like. If you want to have a more complex icon content that consists of more than one control, be sure to wrap them inside a layout control and pass the layout control as content. If you want to share a common icon layout structure for the content of multiple windows, define an appropriate DataTemplate and set it to the HeaderTemplate property of the RadWindow.